America Revealed: Are tornadoes more common because of climate change? Are tornadoes more common because of climate change? As the city of Joplin deals with the devastation from Sunday's tornado, some people might wonder whether these extreme weather events are getting more common because of climate change. The answer is that no one really knows. 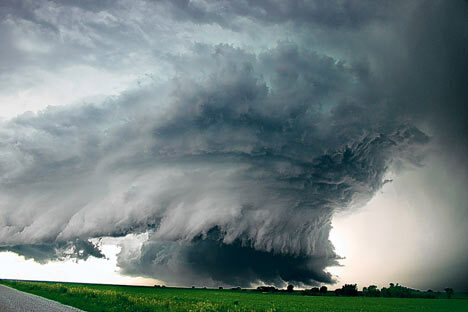 A tornado is a rotating column of air that stretches from the bottom of clouds to the Earth's surface. They can occur in a wide range of shapes and sizes, typically manifesting as a funnel of condensation surrounded by a cloud of dust and debris. Wind speeds in an average tornado reach more than 100mph (160km/h) and the system itself is less than 100 metres across, but extreme events can be several miles across, with wind speeds of more than 300mph. It is difficult to relate any individual weather event to climate change and, unlike with hurricanes, there is little robust research on whether the warming planet is causing any noticeable effects. Grady Dixon, assistant professor of meteorology and climatology at Mississippi State University, told AFP: "If you look at the past 60 years of data, the number of tornadoes is increasing significantly, but it's agreed upon by the tornado community that it's not a real increase. It's having to do with better (weather tracking) technology, more population, the fact that the population is better educated and more aware. So we're seeing them more often." Writing on the Climate Central website, the policy analyst Andrew Freedman said climate change was already changing the environment in which severe thunderstorms and their associated tornadoes form, and that it was bound to have some influence on tornado frequency or strength. "But as of now, no discernible trend has been detected in the observational data, and studies of how tornadoes will fare in a warmer world show somewhat conflicting results." He added: "Since more moisture gets added to the atmosphere as the climate warms, additional water vapour may help severe thunderstorms and tornadoes to form. On the other hand, wind shear is expected to decline due to climate change, which would argue against an increase in tornado numbers." Around a thousand tornadoes hit the US every year, according to the National Oceanic and Changes in extreme weather and climate events have significant impacts and are among the most serious challenges to society in coping with a changing climate. Though every state experiences them, tornadoes have tended to be most common around an area between the Rocky mountains and Appalachian mountains, nicknamed "tornado alley". For the most part, they form during the spring and summer, with the season coming earlier in the south and later in the north. It is well established through formal attribution studies that the global warming of the past 50 years is due primarily to human-induced increases in heat-trapping gases. Such studies have only recently been used to determine the causes of some changes in extremes at the scale of a continent. Certain aspects of observed increases in temperature extremes have been linked to human influences. The increase in heavy precipitation events is associated with an increase in water vapor, and the latter has been attributed to human-induced warming. No formal attribution studies for changes in drought severity in North America have been attempted. There is evidence suggesting a human contribution to recent changes in hurricane activity as well as in storms outside the tropics, though a confident assessment will require further study. Current and future impacts resulting from these changes depend not only on the changes in extremes, but also on responses by human and natural systems. Is there really Global Climate Change Occurring now? Our research project concerns the phenomena of tornadoes, their frequency and magnitude, and possible correlations between that and climate. Investigations will be made into the effect of events such as El Nino and La Nina in regards to tornado occurrence and strength. Research will be conducted with data from 1950 to 1999, and in several geographic regions: Texas, Nebraska, and Ohio. We hope this will give us both a broad overview of the topic, as well as more localized data showing what happens to locations regularly experiencing tornadoes, and those that lack much pronounced tornado activity. Relationships in our data could assist authorities in preparation for aid to families and businesses, as well as further strengthen the belief that we must reduce emission of harmful pollutants into the environment. Results from data show a stronger correlation in tornado magnitudes by state over the 1950-1999 time period, as well as in El-Nino and La-Nina years. This suggests that those events affect our three states in similar manners. Results pertaining to frequency are less conclusive, as p-values tend to either be split a slight tendency to show a significant difference in data sets and rank orders, as detailed in our report. This means that there is a lack of strong evidence to relate tornado frequency to El-Nino or La-Nina years. Variations in this generalized conclusion are detailed in the results and conclusion sections. Tornadoes have struck every U.S. state, including Alaska and Hawaii. But most tornadoes form in a belt from Nebraska southward through central Texas known as Tornado Alley and in the Southeast. Wind speeds in tornadoes can vary from 72 to almost 300 mph. When the El Nino/Southern Oscillation peaked in 1997 and 1998, much talk was given to the theory of global warming and its possible connection to an increase in extreme weather. In some areas of the United States, tornadoes are and have been a serious risk to property and lives. Are tornadoes a part of this web of phenomena possibly related to the theory of global warming? Could a possible increase or decrease (depending on the area) be an indicator of global warming? Our hypothesis is that the increase in greenhouse gases plays a role in the formation of tornadoes. This means that we are experiencing more tornadoes and tornadoes of greater magnitude as a result of both global warming and strengthened cycles such as El Nino and La Nina. We are cautious, however, not to underestimate the advances in forecasting and detection technology which may have led to an increase especially in the number of tornadoes reported. A convective cap is a layer of hot, dry air in the middle layers of the atmosphere above the surface. Often, temperatures increase with height in this layer and relative humidities are extremely low. As you can see in the graphic above, warm humid air in the lower layers of the atmosphere near the surface is heated by the sun, but is not allowed to rise and initiate clouds and precipitation because of the hot, dry air above it. As the air near the surface continues to heat up, it builds up an enormous amount of energy much the same way boiling water in a pot with a heavy lid on it would. If a triggering mechanism, such as a cold front or dryline, moves into the area, the convective cap may weaken enough to allow the heated, humid air near the surface to burst through the cap and initiate extremely violent convection. Supercells, along with intense tornadoes, often form as a result of this violent convection.